Yokai Spooktacular special guest, Matt Alt! So, first off, apologies for the delay in the posting of this episode. I’m actually editing and writing and trying to get this online from a hotel room in China. I’m in country number four of a four-country Asia visit for my work. One of those countries I was able to visit, however, was the land of the rising sun, Japan. And since I was in Tokyo and since this is the October episode of the show, we have a special interview (conducted in person) with Matt Alt. 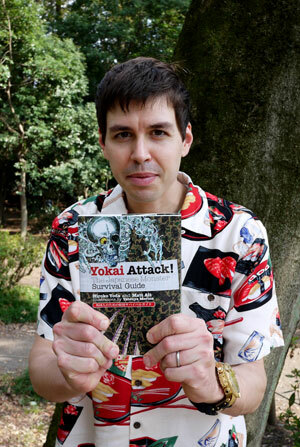 Matt is the co-author of Yokai Attack!, a book that focuses it’s gaze on the creepy and weird ghosts and goblins of Japan. Matt met up with me in an area of Tokyo called Kichijoji and talked about these wild creatures and why they exist. In addition to Mr. Alt, Heather and I discuss the original Yokai trilogy and the apparent curse that has been placed on the Kaijucast headquarters! There’s a little bit of news (of which I’m sure you’ve all heard by now, since this episode has taken me WAY too long to finish) and it wouldn’t be an episode of the Kaijucast without some suggested reading. Hindsight is 20/20, right? I really should have edited my audio together on the plane so that it was ready to drop in the interview with Matt. So because of my poor podcast planning, this episode was delayed over a week. Why? Because once we left Japan, all of my free time went towards meetings, factory tours, dinners and other nightlife. It has been a bit of a whirlwind of activity here in Asia. Apologies to you, my dearest listeners. Also thanks so much to DJ Fulci of the Horror Holocaust Radio podcast for letting me borrow his mini-recorder. Make sure you check out their shows and commentaries! Criterion GOJIRA / GODZILLA KING OF THE MONSTERS is a GO!